I am in the process of implementing the DQN model from scratch in PyTorch with the target environment of Atari Pong. After a while of tweaking hyper-parameters, I cannot seem to get the model to achieve the performance that is reported in most publications (~ +21 reward; meaning that the agent wins almost every volley). My most recent results are shown in the following figure. Note that the x axis is episodes (full games to 21), but the total training iterations is ~6.7 million. Feeding model stacks of 4 last observed frames, scaled and cropped to 84x84 such that only the "playing area" is visible. Treat losing a volley (end-of-life) as a terminal state in the replay buffer. 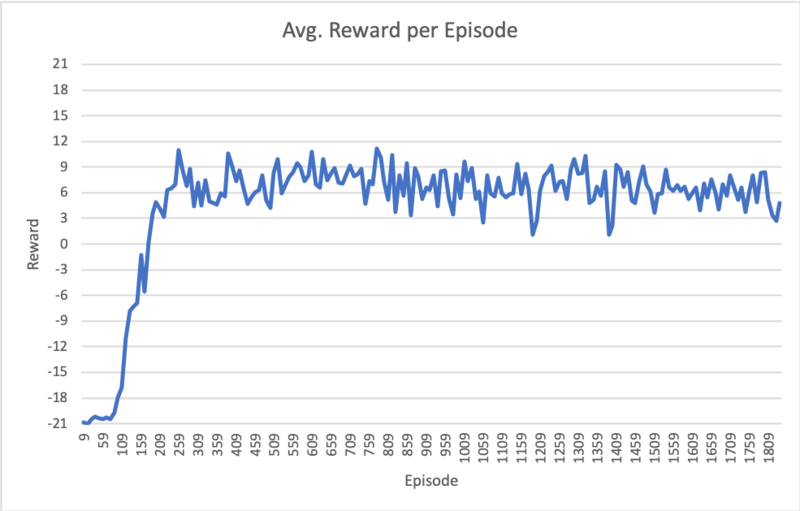 Has anyone had a similar experience of getting stuck around 6 - 9 average reward per episode like this? Any suggestions for changes to hyperparameters or algorithmic nuances would be greatly appreciated! Incase you still haven't been able to resolve the problem, here's a link to the answer to my own question, which has the step-wise changes I made to achieve a +18 average score saturation using just a 10000 replay buffer size and a normal Double DQN (DDQN), trained for about 700-800 episodes. The updated code can also be found here. No fancy changes like Prioritized Replay Buffer or any secret hyperparameter changes are required. It's usually something simple, like a small problem with the input preprocessing step. Not the answer you're looking for? Browse other questions tagged deep-learning reinforcement-learning python or ask your own question. Each training run for DDQN agent takes 2 days, and still ends up with -13 avg score, but OpenAi baseline DQN needs only an hour to converge to +18? Why does self-playing TicTacToe not become perfect?